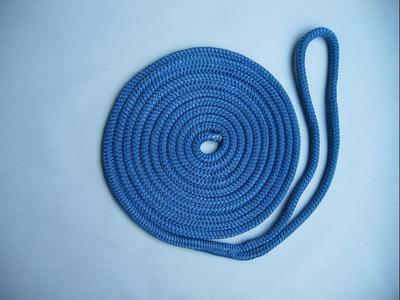 1/2" X 25 foot Nylon Double Braid Dock Line. Solid BLUE in colour. Made with 100% Nylon and professional hand spliced with a 12" eye in one end. The other end is heat sealed to prevent fraying. Rope tensile strength 8,400 pounds or 3,794 KGS.